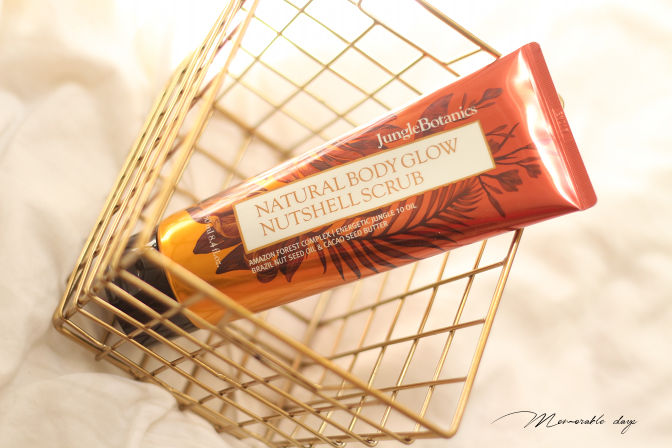 Review: JungleBotanics Natural Body Glow Nutshell Scrub | Memorable Days : Beauty Blog - Korean Beauty, European, American Product Reviews. Hi All! 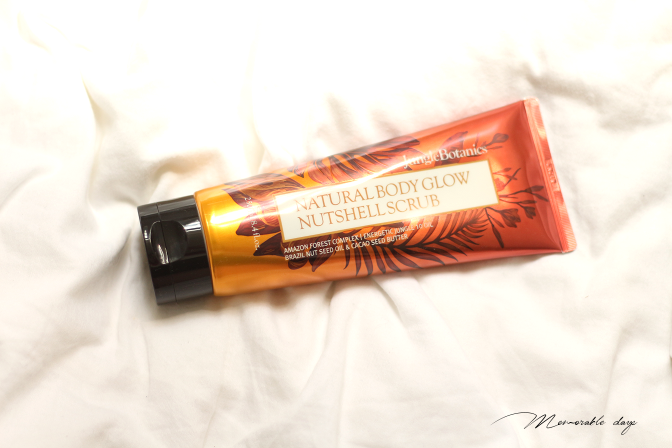 Today another review, but this time it's a body scrub! You might have seen this product around internet recently, since Wishtrend has been promoting it a lot! 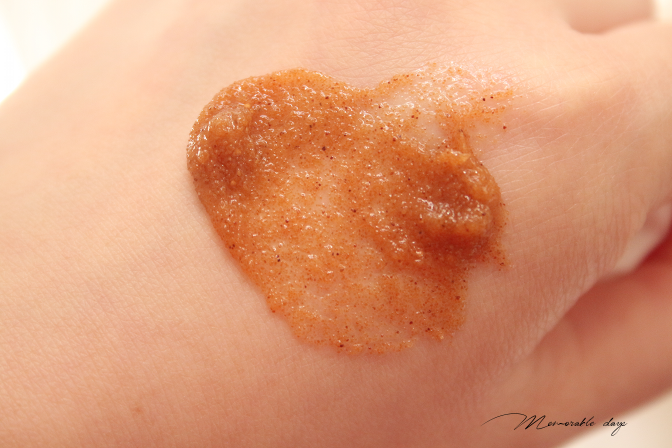 It's the Natural Body Glow Nutshell Scrub from the Korean brand JungleBotanics. It's my first time hearing about this brand to be honest. Want to know my thoughts about this product? Keep on reading! This is a body scrub made with round cut walnut shells to gently remove dead skin cells and impurities on the body in a natural way. It includes vegetable oils such as cacao seed butter and Brazil nut seed oil. It leaves the skin moist, smooth and creates a glowy finish on the skin, at least that's what they claim. It's suitable for sensitive, dry and flakey skin. Round-cut Nutshell Granules: at first glance, the nutshell granules look like ordinary grains of sand. When you take a closer look, you will see the porous surface of the granules. This aids the removal of dead skin cells and other skin impurities by attracting them, making this body scrub ideal for sensitive skin. Walnut shell granules are made of 100% walnut shells, which are biodegradable, thus lowering our ecological footprint. It comes in a white box with English as well as Korean description on it (I forgot to take a picture of the box). The product itself has a gorgeous yellow orange gradient packaging. Apply the scrub to damp skin. Massage in circular motion over the entire body. It will turn into a white milky texture when you combine it with water. Rinse well with lukewarm water. Use 2-3 times weekly. It just looks like grains of sand and that's also how the texture of this scrub it. It's an orange/brown mild scrub that you can massage easily. It has a very heavy scent of fresh nuts in my opinion which will stay on the skin as well. I personally don't like heavily scented products so it's not my favourite, but that's just my opinion. This scrub includes a lot of natural oils which is great for the skin. However, according to Cosdna.com, it does contain a few ingredients that might irritate the skin. I received this product from Wishtrend.com for review purposes, you might have seen them on Youtube before. I wrote about them a while ago here. The scrub is sold there for USD$23.90 including free shipping. If you want to save some money, feel free to use coupon code: AF16AUGUST10 to get 10% OFF when purchasing more than USD$50.-, the code will last until the end of this month. - comes in a squeeze tube, hygienic. Overall I think it's an okay scrub but I am not blown away by it. I was interested because of the great oils that is included in this product. I have Keratosis Pilaris, which are small red bumps on the surface on the skin. It occurs when the human body produces excess keratin, a natural protein in the skin. The excess keratin surrounds and entraps the hair follicles in the pore. Therefore you will get tiny red bumps. I wrote about it in an old blogpost before if you are interested. Because of that on my skin, I am always searching for a good scrub for my body to make it more smooth. This helped a little bit, but not enough to make it very smooth. It didn't leave my skin dry which I am happy about and it didn't irritate my skin. I was surprised because of the size of this tube and I like it that it came in a squeeze tube, which makes it more hygienic. The price of the product is a bit on the high side though. And unfortunately it doesn't make my skin glow like what they claim. I personally don't like products which are scented, and the scent of this product is strong and stays on the skin, so you will smell it even though you rinsed the scrub off. In the end it's all about personal preferences and what your needs are. If you are just searching for a mild scrub for the body that removes dead skin cells and you don't mind the strong scent, this might be for you. This product is great for people with dry skin. If you personally don't like strong scented products it's better to skip this product. note: this product was sent to me for review purposes, but this didn't affect my opinion about the products. this blogpost contains affiliate links, see disclaimer.